Twitter and Facebook might soon replace traditional professional development for teachers. Instead of enduring hours-long workshops a few times a year, teachers could reach out to peers on the Internet in real time for advice on things like planning a lesson (or salvaging a lesson that’s going wrong), overcoming classroom management problems, or helping students with disabilities. 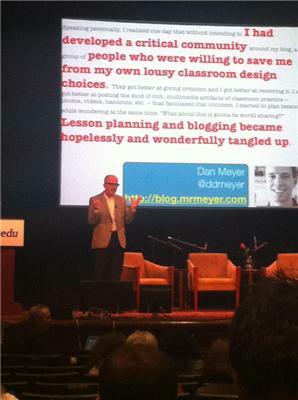 Or, at least, that’s what a group of Internet-savvy educators who convened in New York City this week are hoping. Traditional forms of on-the-job training for teachers have been much-maligned in recent years by experts and by teachers themselves. “Many times professional development is like herding cattle: We’re taking everybody in the same direction. We’re going to learn the same thing,” said Eric Sheninger, principal of New Milford High School in northern New Jersey. For-profit companies, nonprofits and universities make lots of money providing training to schools, but little research exists on what types of professional development for teachers work best. Increasingly, schools and districts are adopting what experts say are more promising ways of training teachers that involve more coaching and teacher collaboration. But some educators who attended the #140edu conference want to push the envelope further, to make teacher training even more individualized and self-directed. Among the attendees were teachers and principals who keep blogs documenting their daily travails and successes in the classroom, which work as guideposts for others and forums where they can glean tips. Some have thousands of Twitter followers and Facebook friends. “A teacher could be teaching a lesson on the Civil War. That lesson could bomb. They could go to their network, pose a question, ask for a resource. In the next period they could have new resources, things to try immediately,” he said. “Traditional professional development can’t offer that immediacy of being a connected educator,” Pace added. Indeed, at the conference, a room set aside for in-person mingling and chatting was often more crowded than the auditorium where panelists were giving their talks.